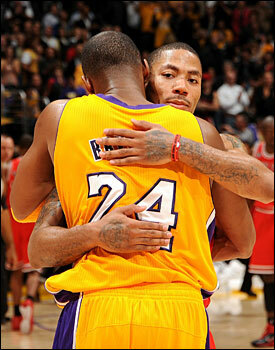 The good news is that Kobe Bryant views Derrick Rose as one of the NBA’s elite players at the young age of 22. The bad news is that Bryant isn’t ready to hand over anything to Rose or anyone else in the NBA for that matter as he and the Lakers seek their third straight championship. Bryant also said that perhaps one of Rose’s greatest assets is an intangible which comes in quite significantly at the end of games, as Rose has demonstrated as of late. It’s the so-called killer instinct, which as Bryant noted, can’t be acquired. “I don’t think you can develop that,” he said. “You either have it or you don’t. [Rose] has had it since he was in high school. Bryant has had that edge since a young age, dating at least back to when he was attending Lower Merion High School outside of Philadelphia. But he also got some help from Bulls Coach Tom Thibodeau, who met Bryant through John Lucas, head coach of the Sixers from 1994-96. Lucas’ daughter went to high school with Bryant and during the summer, Bryant worked out at the same location where Thibodeau, Lucas’ assistant, spent time with some of the Sixers players. Often times, it was Bryant who stayed the longest; thus he and Thibodeau spent a lot of time working one-one-one well before Bryant played his first NBA game. “It gave me a leg up on a lot of high schoolers,” acknowledged Bryant. “A lot of them weren’t hanging around professional basketball players, working out with them and seeing what it takes to be a pro. Also, [to see] some of the pros that had a lot of potential but didn’t amount to anything and what they were doing, which was nothing. It showed me what I shouldn’t be doing. Thibodeau’s Bulls put up a good fight against Bryant’s Lakers when the teams met in L.A. on Nov. 23 before ultimately falling, 98-91. But Bryant said he came away impressed when asked for his impressions of the Bulls. Now in his 15th season at the age of 32, Bryant may not be the player he was several seasons ago, but he is still second in the league in scoring at 26.6 points per game and his team has a mark of 16-6 on the young season. And though the Lakers seem poised to make a run at their second three-peat in the last decade, inevitably there will come a time—maybe sooner than later—when he’s on his way out and the younger stars of the league will take over. So does Bryant feel that the Bulls’ Rose is among those who could step into his shoes—the proverbial passing of the torch? “Oh sure, [but] I’m not passing [expletive],” said Bryant. Does that mean Rose has to come take it, Bryant was asked? “He can certainly try,” said Bryant.